Adductor Hallucis is an two headed intrinsic muscle of foot which is located deep within the plantar side of the foot. 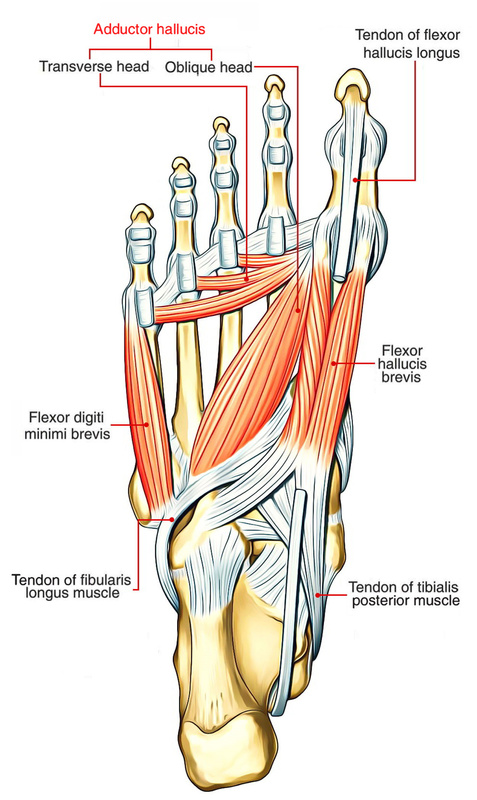 The adductor hallucis muscle enter into the lateral side of the base of the proximal phalanx of the great toe and emerges by two muscular heads, transverse and oblique, which connect near their ends to. The transverse head of adductor hallucis originates from the associated deep transverse metatarsal ligaments. The muscle goes across the sole of the foot transversely via lateral to medial and connects the oblique head near the base of the great toe through the plantar ligaments connected with the metatarsophalangeal joints of the lateral three toes. The oblique head of adductor hallucis is larger than the transverse head and emerges via the plantar surfaces of the bases of metatarsals II to IV and this head passes anterolaterally, through the sole of the foot and joins the transverse head, through the sheath enveloping the fibularis longus muscle. Adductor hallucis arises by two heads, oblique and transverse. The oblique head comes from the sheath of the tendon of peroneus longus and the plantar surface of the bases of the second, third and fourth metatarsals. The transverse head comes from the deep transverse metatarsal ligament and the plantar surface of the lateral three metatarsophalangeal joints. The transverse head enter medially. The oblique head pass forwards and medially. To enter into the lateral side of the bottom of the proximal phalanx of the great toe Both heads connect and mix with the medial part of the flexor hallucis brevis. Lateral plantar nerve supplies Adductor hallucis, root value S2, S3, and the skin covering this area is supplied by root S1. Adductor Hallucis adducts the great toe in the direction of the second toe, and flex the first metatarsophalangeal joint. Adductor hallucis gives the last thrust needed in walking, running or jumping and working with the abductor hallucis. Adductor hallucis enables to control the stance of the great toe to ensure that active flexion can be generated. It will also assist to maintain the anterior metatarsal arch of the foot Because of its transverse position throughout the forefoot. The pull of the adductor hallucis will get over that of the abductor, thus adding to the deformity often seen in the great toe. If the medial longitudinal arch is allowed to fall, enabling the foot to wander medially and the toes laterally.